Welcome to the 266th Tablescape Thursday! It’s rainy and little chilly out today so we’re tablescaping in the breakfast room. This table setting started out with super practical glasses but I changed them toward the end to these pretty amber glasses from Noritake. They also came in another flavor: Raspberry & Lime. Today they are being used to hold a fragrant candle. Someone is peering down watching us while we eat! 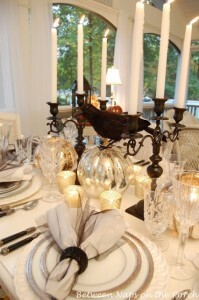 A little candlelight… I started out with this glassware and changed to the amber for this table setting. Either would work great but I think I like the amber stemware better with this setting. Next PostA Secret Project Reveal: Kicking Off Denim Do Over! Adorable! I love that you kept changing the raven’s position! 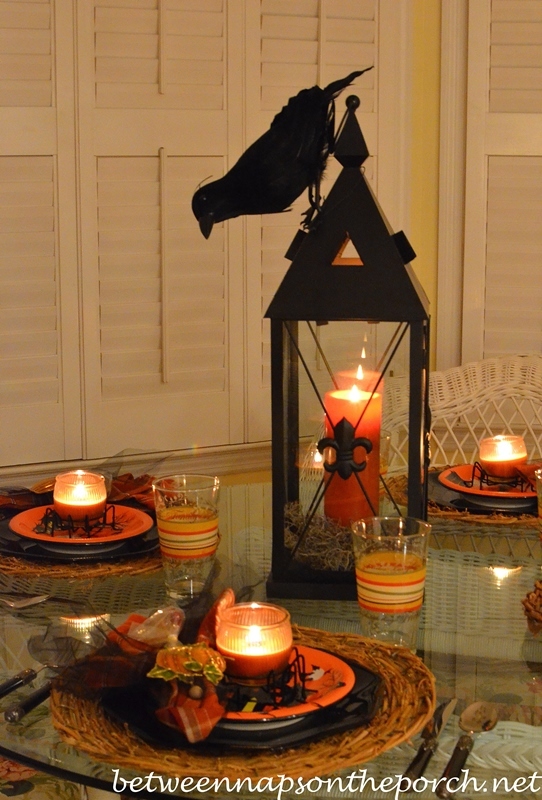 What a cozy little creepy table for a little candlelight nosh! Good Morning Susan…it’s chilly here in Michigan too. 49 degrees!! Brrr! Isn’t it fun how it’s the littlest of things that make your heart sing? 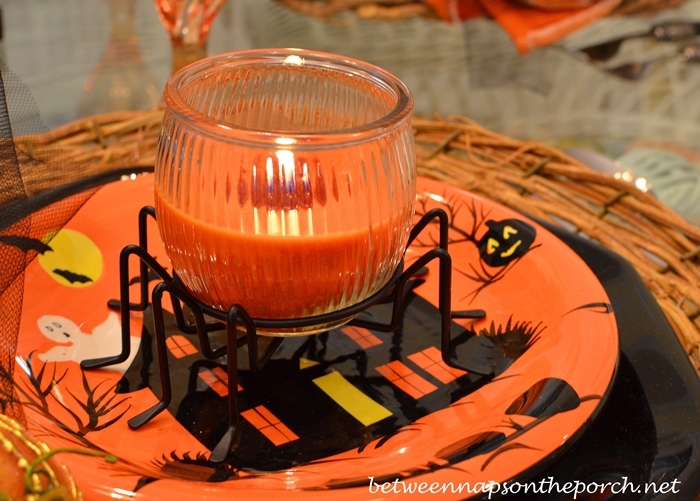 I love the spidery votive candles. The whole tablescape is lovely…but that is just the perfect fun touch. Diane, I so agree! 🙂 It’s those little things that make me happy. Hi Susan, Your new photos showed up but the linky is gone, I’m sure you’re aware! Thanks for letting me know, I just added it back. That’s strange. I’ll let InLinkz know that it’s doing that when the post is edited. It shouldn’t do that. I lost my black crow in the move down to Texas and I am missing him. Love yours on the lantern. You are inspirational as always. Thanks Susan! Susan, you can’t go into Halloween crowless! 😉 Michaels had them when I was in there a couple of weeks ago. What a cute table! 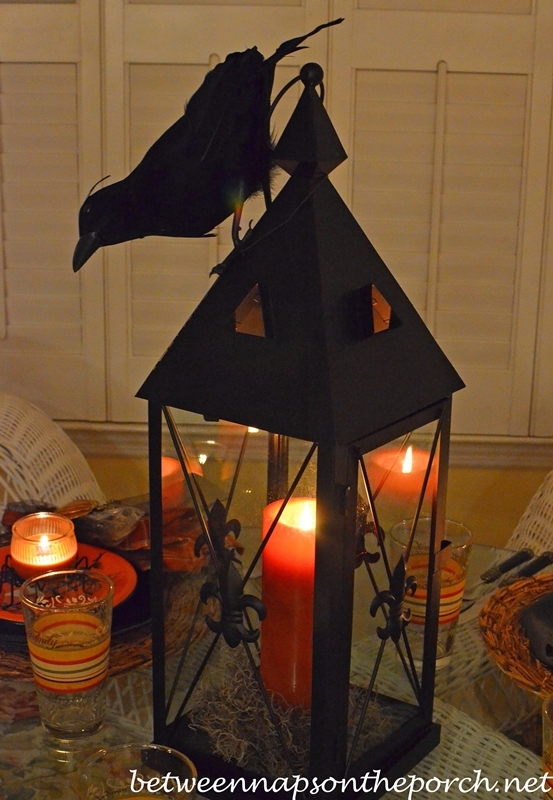 I love the crow on the lantern and the witch’s hat! Thanks, Dawn! Looking forward to your tablescape! Yes, drizzly, yucky here. Dismal is a great description! I love your tablescapes Susan! They are always so creative and give me inspiration to continue creating beautiful tablescapes at my house. Thanks for hosting. Susan, I love this tablescape! Would be perfect for one of our dessert parties! 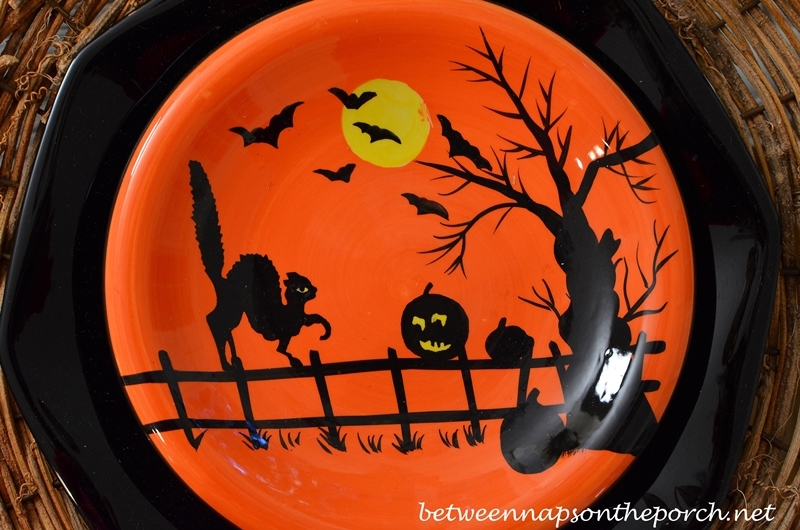 Can you reveal where you purchased the adorable Halloween plates? You must “shop til you drop” to find some of these tablescape supplies. When you see something for a tablescape, do you just buy or order set of 4 or you already have all this stuff? It is amazing what you come up with. You can tell you have so much fun doing this, as it shows through your blog. I still say you should write a book on your decorating and tablescaping ideas! It would be a best seller, that is for certain! Hi Susan love the table setting. I also love the cute little plates but I adore the little dishes you had in your last Halloween table setting with the cute little children walking across the plate. Well I ran right out to get a few at our Home Goods store and their was a big sign across the front of the store saying it was closing. O No!!!!!! Iam in Indiana so I’ll have to cross the river and see if the store in Ky. has them. 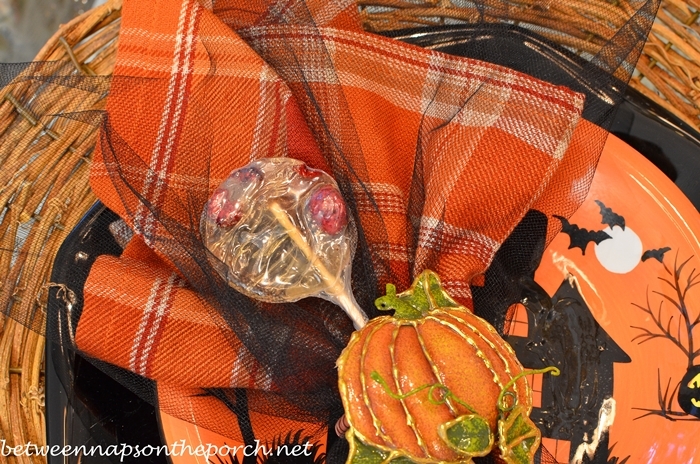 Have a great Fall day, its rainy & cool here too…. What???!!! They can’t do that! One that’s near me closed but it was to just move down the street. Do you think they are just moving to a bigger, better location? Glad you still have one you can visit…one of my fave stores, for sure. I sooo love your table! Those plates and those napkin rings are too cute, but why did you replace the nice orange glasses? Julie, here’s probably my best tables setting tip ever: pick up salad plates at Walmart, HomeGoods, Marshalls for TJ Max (they are (usually $3-4 each) and layer them atop white or off white dishware and you have an instant holiday table. As long as you have a basic set of white or off white dishware, you’re in business! 🙂 You can change the look and feel of the table for each holiday or season by just using different salad plates. Of course, a fun centerpiece never hurts either, and it can be any decoration or collectible you already have. 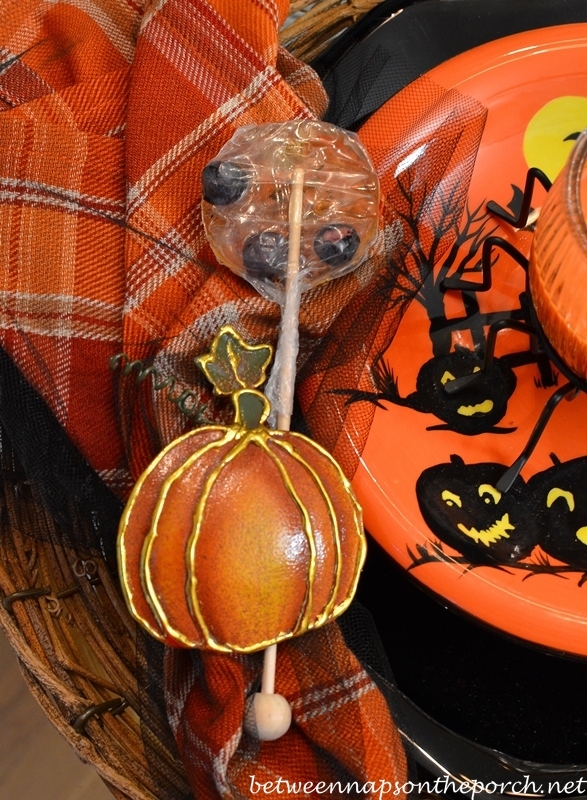 Check out the stock at surlatable.com for some unique Halloween accessories. Still a bit pricy but reduced. Also Pottery Barn (I think it was on their website). Susan, every AM as I periodically check e-mail, I can hardly wait to see your daily posting. Then I hop around from post to post & all of a sudden two hours have passed. Thank you for keeping us inspired; and special thanks for telling us where you’ve purchased things. Living in a small town, we have no Home Goods, Pottery Barn, or many of the places you list – we do have a Dollar Tree, Wal-Mart, & a Pier 1 about 45 minutes away. 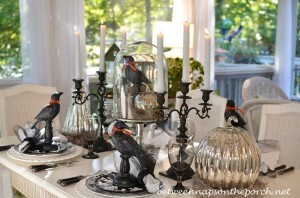 Today’s Halloween Tablescape with lantern is so fun! Love the raven atop the lantern (love your ravens!) and the spider legs votive holders. You always put so much detail in your tablescapes. You & others on your site have inspired me this fall to do a bit more than an orange pumpkin & yellow mum on the porch. Thank you! Thanks for hosting TT again this week. I’m glad I could join in. P.S. 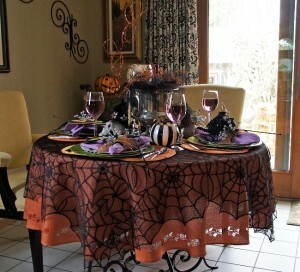 Like the amber glasses in this tablescape instead of the striped ones. Also vote for the black witch’s hat w/orange & black accents on the front door instead of the striped one this time. The striped one, with the way it sits, reminds me of the Sorting Hat in Harry Potter. Oh how I wish we had a big porch…and a mantle. Susan – As always, your table is so creative! The centerpiece is so cute with Mr. Raven or Crow watching over the table. With all of the cute plates and accessories on the table, I am more drawn to the plaid napkins, than anything else. I definitely have an “issue” with plaid and those are great napkins! 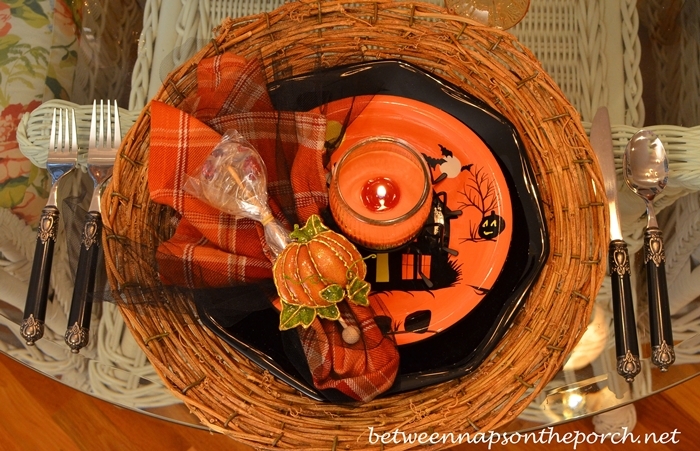 Love the cute pumpkin napkin rings, too! You’ve been hosting this party for a long time, thanks so much. I love this casual table, it suits the holiday without going way over the top. Sometimes it’s hard not to add on every holiday/special occasion piece you have. You have mastered that. I’m going to be on the hunt for the spider cupcake/votive holders also. What a beautiful and fun tablescape! Love the plates and the crow peering a top that nice lantern, well, I enjoy all the elements you add to your tablescapes 🙂 Thanks for having us! 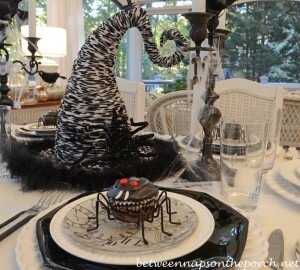 Susan, what a great Halloween tablescape! I love every single element! Thanks so much for hosting! 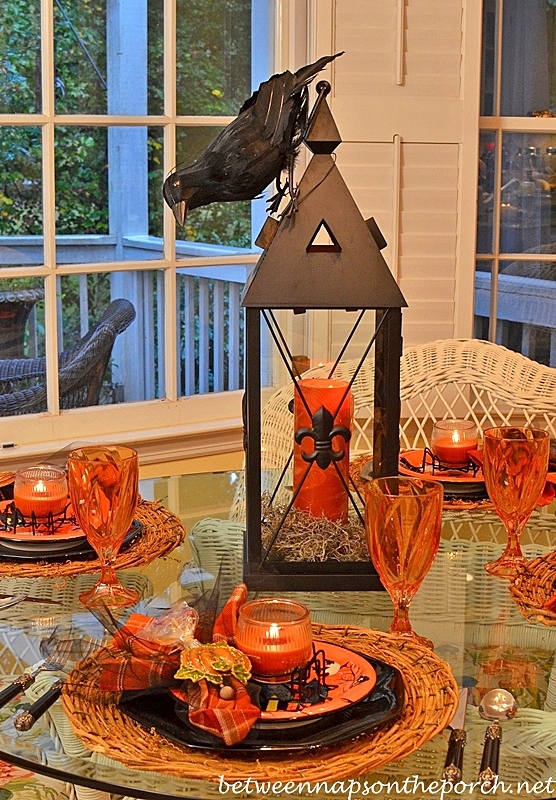 Love the colors on this table and the lantern is cute with the raven on it! 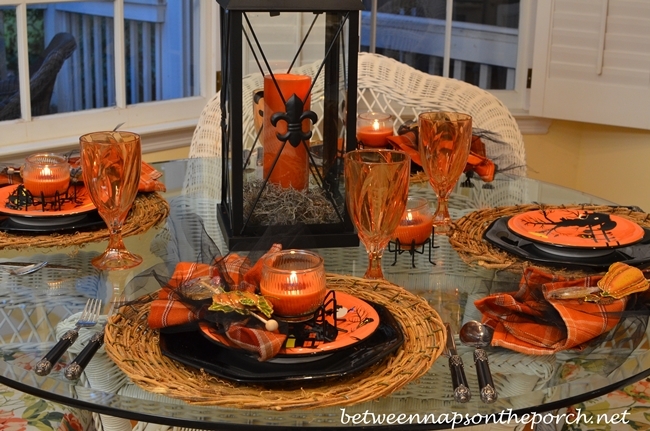 I like those cute orange plates with the cat and how you used the spiders for the candle holders- great idea! The netting over the napkins is a great touch! Those orange glasses are great- I need some! As always your tablescape is outstanding. 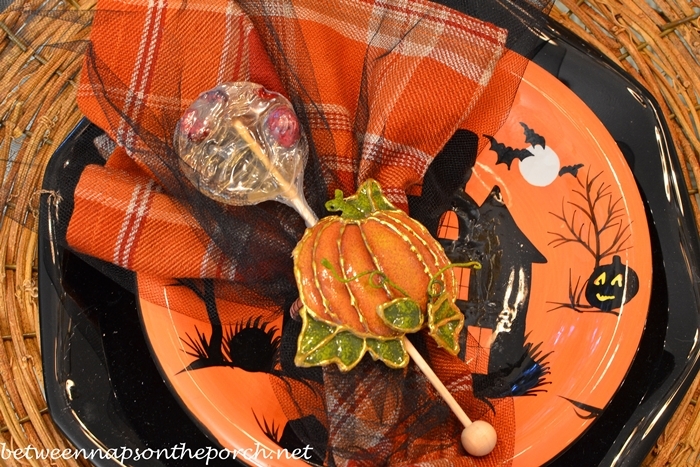 The orange Halloween plates are so cute, especially with the spider cupcake holders and the pretty plaid napkins. Thank you so much for hosting and thank you for helping me out in my efforts to try to learn how to link for a party. You must be a good teacher because I haven’t had a problem since you explained to me what to do. Awesome! So glad it’s working okay, Candy! Thanks for hosting! I’m glad I could join you this week. Well, fiddlesticks! They must have gone pretty quickly. I just lucked out because I hadn’t been in an HL in months. Too bad they don’t sell stuff online, or at least I don’t think they do. Would be nice to just be able to order things when they first come out. Susan, I also vote for the amber stemware as your final choice, but I did like the practicality and fun of the striped ones. 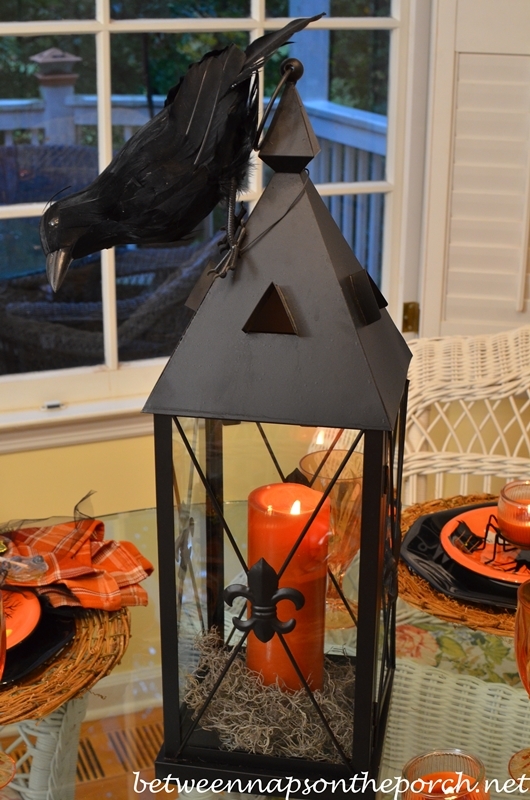 I’ve seen a lot of creepy birds in the stores this year — is that just that I’m new to tablescaping or that it’s the “in” thing to use black birds at Halloween? I’ve got one of my own for Halloween week! Thanks for hosting. Thanks, Jennie! I started seeing the blackbirds being used a lot just a couple of years ago. 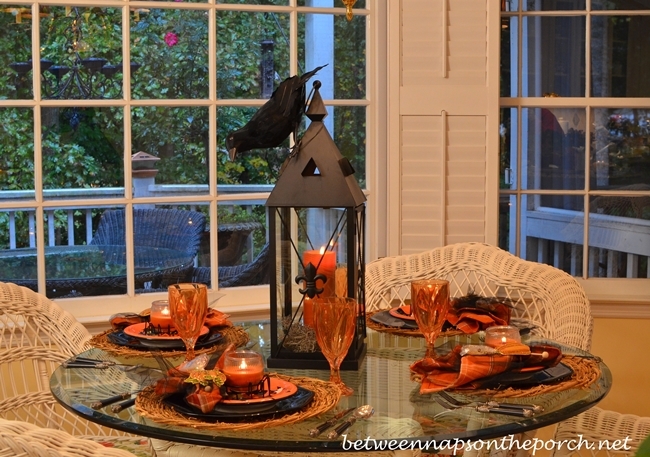 You know what got me all fired about ’em was this Pottery Barn porch that you can see in this post: https://betweennapsontheporch.net/halloween-decorating-and-party-ideas/ I loved that porch and had to have some crows after seeing it. 🙂 The PB crows on that porch are HUGE! They are also a bit pricey so I settled for the smaller ones at Michaels. I love decorating with things that aren’t too scary and blackbirds fall into that category for me. They really are popping up everywhere now, just as you say! Love your festive tablescape, Susan! Thanks for hosting each week! I’m growing to like orange more and more (used to not like it!) This is just enough “scary” stuff and is cute! Those cupcake holders are really cute. I like both sets of the glasses! I can almost copy your table,but missing those glasses. Guess I need to go shopping! Really like the crow on the lantern. I always enjoy your table scapes! Thanks for hosting each week. Your breakfast table is so beautifully decorated. I especially like the centerpiece. Great setting, especially the raven!! Thanks for hosting a great party! Love your traditional black and orange scape. I like the second glasses too! Yep, that’s where I bought them, too. I do love them as well. Claudette, do you put them in the dishwasher? I’ve been washing mine by hand, was afraid they would fade in the dishwasher. Yes! I usually do wash them in the dishwasher and they look as good as the day I bought them. That’s great to hear! Amazing for just $1, isn’t it?